Privacy has become an increasingly relevant topic in the field of social information systems. A recent book on Social Information Access (https://doi.org/10.1007/978-3-319-90092-6_2) includes a chapter on this topic, authored by one of the instructors of this tutorial. Arguably, privacy is all the more relevant in the fields of eGovernment and eDemocracy, which covers a wide array of sensitive topics such as eHealth, political discussion, and access to government services. Notably, eGovernment and eDemocracy applications increasingly gather tremendous amounts of user data as input to the democratic process, for political discussion, or for recommendation purposes. This data may pose a severe threat to user privacy, e.g. if accessed by untrusted parties, or used inappropriately. Hence, it is of paramount importance for system designers and service providers in eGovernment and eDemocracy to learn about ways to build systems that respect the privacy of their users. 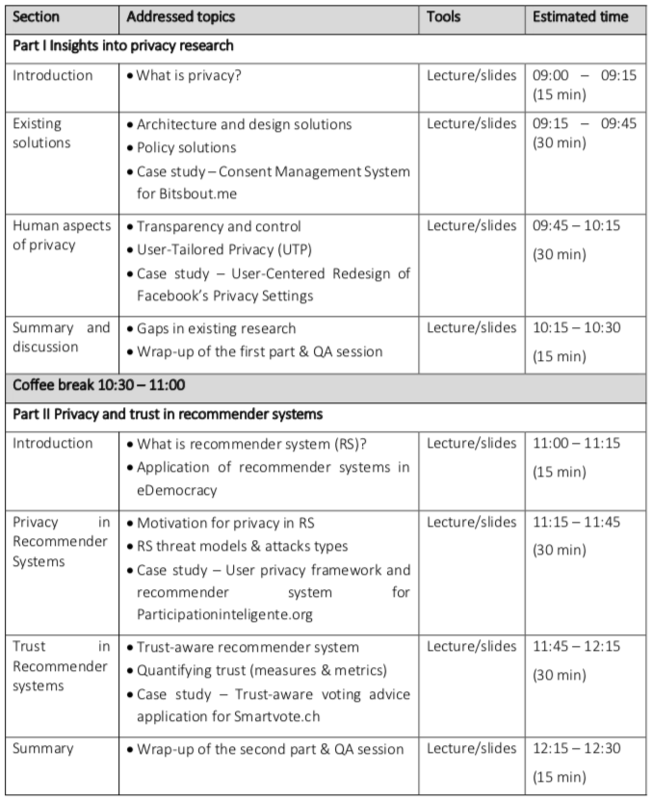 However, we count only two papers about privacy (including one by one of the instructors of this tutorial) at the three most recent installments of the ICEDEG conference! We, therefore, believe that it is time for a privacy-related tutorial at ICEDEG. In this tutorial, we overview the state of the art in online privacy and apply it to the fields of eGovernment and eDemocracy. We analyze common privacy risks imposed by eGovernment and eDemocracy systems, survey solutions, and discuss implications for users. While the tutorial will be mostly “lecture style”, it includes an in-depth presentation of case studies and discussion of topics at the end of each section. The significant amount of time reserved to engage in discussions with the audience regarding, e.g., technical, social, and ethical aspects of privacy in eGovernment and eDemocracy. The tutorial consists of two parts, the first is presenting the insights of privacy research, the second is introducing the privacy issues in recommender systems. The first part addresses online privacy, including the theoretical background of privacy as a concept, antecedents of user privacy decision-making, human aspects projected on privacy-geared solutions, existing gaps and future outlook. The second part focuses on recommender system technologies which are despite their advantages and well-adoption across online services including eDemocracy processes have a number of risks related to privacy issues. The course is designed for researchers in the fields of eGovernment and eDemocracy (and closely related areas). The introductory nature of our tutorial makes it suitable for students and early-career researchers as well as more experienced researchers. No prior knowledge of privacy research nor the programming competencies is required. There are no special equipment requirements. The presenters will be using their own computer for the presentation. Certain concepts will be explained using videos, so room audio should be available if possible. The slides used in the tutorial will be publicly available after the tutorial. Attendees will have access to an author copy of the Social Information Access Handbook chapter on privacy. Bart has presented a previous tutorial on privacy for recommender systems at the ACM Recommender Systems conference. His job at Clemson involves organizing webinars on the topic of privacy in eLearning. He has written numerous conference papers, journal articles, and book chapters on privacy, including chapters on privacy in the “Social Information Access” and “Recommender Systems” handbooks published by Springer. Aigul has worked as a teaching assistant at University of Fribourg (2014-2018), specifically, lectured the seminar of “Privacy and Trust in Recommender Systems” (2015-2018), conducted lab classes on Recommender systems, Databases, Web-analysis, and monitoring. She has a 4-year scientific experience in topics of user privacy behavior in eDemocracy, recommender systems, and application of fuzzy logic. Her articles address privacy issues in political participation and voting advice applications and published in peer-reviewed conference proceedings and book chapters. participation. In eDemocracy & eGovernment (ICEDEG), 2018 International Conference on (pp. 89- 94). IEEE. Kaskina A. and Meier, A. Integrating privacy and trust in voting advice applications. In eDemocracy & eGovernment (ICEDEG), Third International Conference on (pp. 20-25), 2016, IEEE. Kaskina A. and Radovanovic, N. How to Build Trust-Aware Voting Advice Applications? In International Conference on Electronic Government and the Information Systems Perspective (pp. 48-61), 2016, Springer International Publishing. Terán, L. and Kaskina A. Enhancing voting advice applications with dynamic profiles. In Proceedings of the 9th International Conference on Theory and Practice of Electronic Governance (pp. 254- 257), 2016, ACM. Kaskina A. Differentiated User Privacy Support in the Digital Society. In Wirtschaftsinformatik in Theorie und Praxis (pp. 141-152), 2017, Springer Fachmedien Wiesbaden. Bart Knijnenburg is Assistant Professor at Clemson University, USA. Researcher on privacy decision-making and recommender systems. Our online lives are full of small but difficult decisions. Which app should I install? Should I post this on Facebook or not? Which YouTube video should I watch? What will this e-commerce website do with my personal information? In my research, I try to understand the psychological principles behind these online decisions. Using Big Data and Machine Learning principles, I try to make these decisions a little easier with better user interfaces and “smart defaults”. Daricia Wilkinson is a third year Ph.D. student in the Human-Centered Computing (HCC) program at Clemson University being advised by Dr. Bart Knijnenburg. Her research interests meet at the intersection of people and technology. She creates solid foundations to understand users’ needs, to deliver insightful research and effective design that acknowledges broader implications. Specifically, she works on creating usable privacy interfaces and improving the user experience of recommender systems. 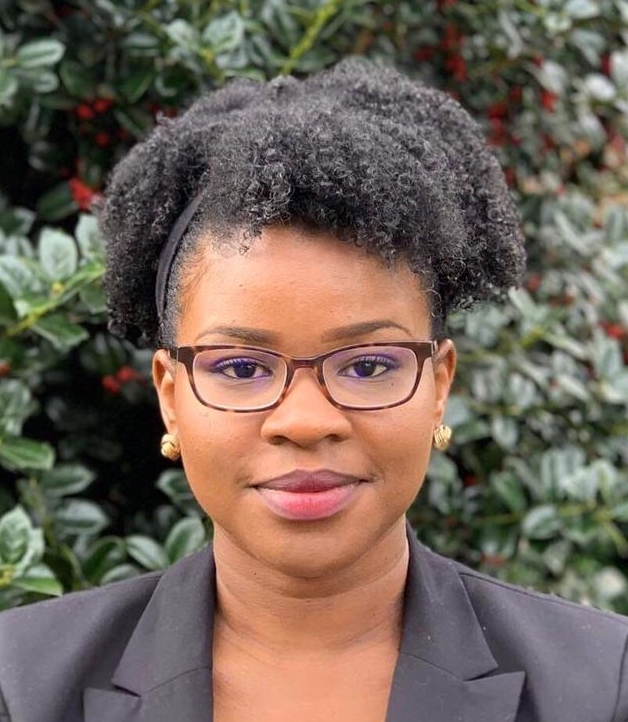 Before attending Clemson University, she earned her Bachelor’s degree in Information Systems and Technology from the University of the Virgin Islands (UVI). She has also worked at Carnegie Mellon's CyLab as a privacy researcher. 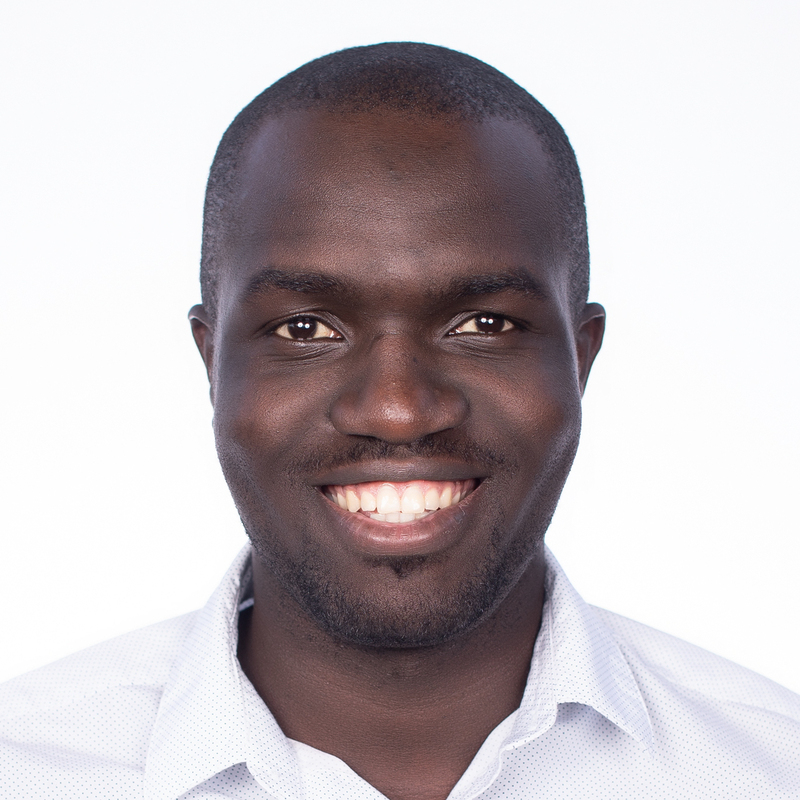 Moses Namara is a Facebook Scholar and third-year Ph.D. candidate in Human-Centered Computing (HCC) at Clemson University advised by Dr. Bart Knijnenburg. 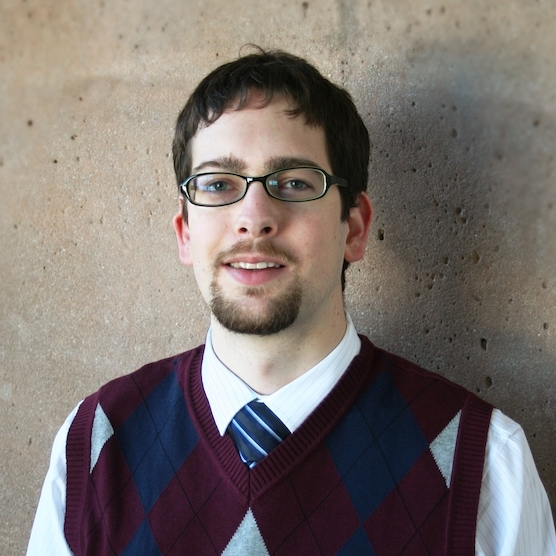 His research focuses on user-tailored privacy and human factor issues related to the design of privacy-enhancing and social media technologies. Specifically, his research seeks to understand users' needs, motivations, attitudes, and behaviors that foster their online privacy behaviors. This he then uses, to develop adaptive interfaces and recommendations that enhance their online privacy, ensuring that they are comfortable to adopt and use various online technologies. He completed his B.S. in Computer Science from the University of Maryland, College Park.